I love masks. At a very young age I whipped them up for the entire family out of oatmeal and mashed bananas (very hydrating) or honey and brown sugar (great exfoliator). These days I am far more likely to throw one on that comes out of an attractive jar that I've purchased. I'm picky though, when it comes to masks; if I am going to spend the same amount on a mask as I would a facial it had better work. 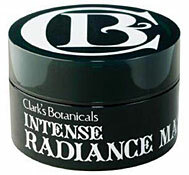 I was thrilled when I learned that Clark's Botanicals had created a new product called Intense Radiance Mask a few months back. With a name like "Intense Radiance" and my love of all of the other products in Francesco's line, I figured that this mask would not disappoint. Not only does it not disappoint, it is kind of amaze. Intense Radiance Mask clarifies with white clay while algae extract and collagen nourish and rejuvenate skin. I apply the mask once a week and leave it on for about 25 minutes to receive the full benefits of all of the wonderful ingredients it contains. It clears up breakouts without being drying and plumps skin, leaving it tighter and brighter. This will definitely be a winter staple in my skin care routine in order to avoid the dullness that I often experience this time of year.